Powers/Abilities: M'Tuba is an expert tracker of jungle animals. As a hunter, he is skilled at archery, throwing spears and knives. M'Tuba has a great affinity for animals of the jungle such as his trained monnkey Mikki and has some talent at rustic medicine. M'Tuba is also an expert in the law of his people and helps train the children of his tribe in their ways. (Lorna the Jungle Queen#3 (fb) - BTS) - While he was a boy, M'Tuba heard from his great-grandfather of a lost city in the jungle and displayed a gold coin which he claimed came from the city. However, M'Tuba believed his great-grandfather had simply found the coin and invented a story about it. (Lorna the Jungle Queen#1/2 (fb) ) - M'Tuba is from a line of lawgivers in his people's tribe. When he was a young man, the outcast Kubali demanded M'Tuba rescind the law protecting the sacred white pig from harm so that Kubali could return to his village. With Kubali holding a knife to his throat, M'Tuba had to agree. Once M'Tuba had changed the law, Kubali took him into the jungle and tied him to a tree with a piece of meat to bait a wild animal into killing M'Tuba. Just as Kubali had finished the trap, Numa the lion appeared and prepared to maul Kubali. M'Tuba was able to drive Numa away through verbal command, but when Kubali refused to untie M'Tuba, Numa struck again and this time killed Kubali. When M'Tuba returned to his people and recounted what had happened many thought he was a magician but M'Tuba knew Numa simply understood what was just. (Lorna the Jungle Queen#1) - Years later, M'Tuba served as a guide to Lorna and her father as they lived in a jungle trading post. One day, Numa the lion attacked Lorna's father and mauled his leg. M'Tuba helped treat the wound but eventually succumbed to the injury and died months later. Lorna decided to learn how to fend for herself in the jungle without her father and asked M'Tuba to train her. M'Tuba taught her everything he knew about hunting, tracking and wielding spears and knives. Finally, M'Tuba declared Lorna had surpassed his own ability. One day, Lorna and M'Tuba ran across the Wafisi, a tribe of head hunters. The Wafisi tied Lorna and M'Tuba to wooden stakes, but M'Tuba's pet monkey Mikki retrieved M'Tuba's knife and cut both of them free. Lorna killed the witch doctor of the Wafisi and claimed his title for herself, then appointed M'Tuba to rule the Wafisi in her place. As they parted ways, M'Tuba gave Mikki to Lorna as her pet. (Lorna the Jungle Queen#1/2) - M'Tuba told the story of Kubali's death to young tribesmen under his tutlege. (Lorna the Jungle Queen#3) - While hunting a gazelle, M'Tuba was nearly pounced by Saki the leopard, but Lorna came to his aid. After opening up Saki, Lorna and M'Tuba found a gold coin like the one M'Tuba's great-grandfather had. Lorna investigated this on her own and found the lost city was real and inhabited by a lost tribe of Egyptians. (Lorna the Jungle Queen#3/4) - A terrible drought came upon the jungle and M'Tuba alerted Lorna to the danger, but rain eventually came and restored the land. (Lorna the Jungle Queen#5/2) - When Monty Mortimer came to the jungle to find his missing zoo tiger, M'Tuba ushered him to Lorna so she could search for the animal. (Lorna the Jungle Queen#5/4) - After Lorna's beau Greg Knight went into the depths of the jungle to find "the lost kingdom," M'Tuba urged Lorna not to follow but she insisted on going after him. (Lorna the Jungle Girl#6/2) - After being stung by a morta plant, M'Tuba went into a comatose state. Lorna and Greg Knight ventured deep into the Black Swamp to retrieve a sample of morta plant juice so that Kada could develop an antidote for M'Tuba's condition. The treatment succeeded and M'Tuba awoke in time to join Lorna in gently kidding Greg when he briefly complimented Lorna. 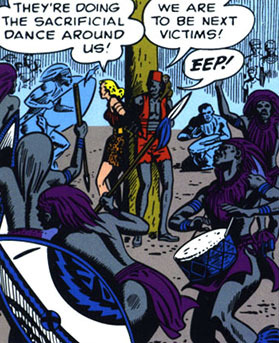 (Lorna the Jungle Girl#7) - After Greg and several others were bitten by a cobra, M'Tuba recognized the bite mark as that of a particular giant black cobra. M'Tuba told Lorna to obtain more of the cobra's venom so that he could develop a cure for the those afflicted. Lorna succeeded in killing the cobra and from its remains, M'Tuba was able to save Greg and all the villagers. (Lorna the Jungle Girl#7/2) - When an outcast named Kativa performed killings while dressed in a hyena skin, M'Tuba told Lorna and Greg about sightings of the killer and informed them how locals believed Kativa was a god. Kativa was ultimately killed by a pack of hyenas. (Lorna the Jungle Girl#8) - After his nephew Baku was assaulted by a supposed ghost, M'Tuba found his tribe losing confidence in him. Lorna stalked the ghost with the aid of her immense ape ally Agu the Giant and ultimately proved the "ghost" was Baku himself who had been scheming with his mother to take the title of chief away from M'Tuba. (Lorna the Jungle Girl#10/2) - When Greg Knight handled a baby gorilla in the wild he was attacked by the infant's father who delivered a stunning blow to Greg, knocking him senseless. Lorna left Greg in M'Tuba's care while she dealt with the gorilla family, seeing that their child was restored. (Lorna the Jungle Girl#10/4) - While tending his crops, M'Tuba pointed out the dormant Mount Inferno to Lorna and remarked it may become active again. Sure enough, Mount Inferno soon erupted because of a creature rising up from beneath the Earth's crust but Lorna and Greg defeated it. (Lorna the Jungle Girl#15/4) - One day Mikki was abducted by the Mask of Doom, a figure dressed like a vulture. When M'Tuba heard of this he admitted to Greg that at some point he had heard a legend claiming Lorna would be destroyed by the Mask of Doom. M'Tuba and Greg sought to rescue Mikki on their own so as to not involve Lorna, but Lorna went after Mikki and unmasked the Mask of Doom as a mere smuggler in diguise who took advantage of the legend. (Lorna the Jungle Girl#16/2) - When herds of bull elephants went on a rampage M'Tuba and his people sealed themselves up in their huts but Lorna discovered the elephants were simply fretting with worry because their mates and baby elephants had been separated from them; Lorna reunited the elephant families. (Lorna the Jungle Girl#19) - When M'Tuba succumbed to a terrible fever, Lorna set out to find Doctor Foster (a white doctor) to treat him as the medicine man Zabu could do nothing. Fearing a loss of reputation, Zabu sent his son Bardu to destroy the medicine. However, Zabu came down with the same affliction as M'Tuba and the Doctor Foster's medicine was needed to save both men; the recovered M'Tuba and Zabu reconciled over the matter. Comments: Created by Don Rico and Werner Roth. M'Tuba stands out as the first black adventure hero to head his own feature at Marvel Comics, albeit his solo feature only lasted for the first issue of Lorna - all subsequent issues gave the supporting feature to Lorna's boyfriend Greg Knight instead. 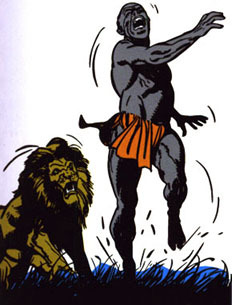 It would be a year before Marvel's second black lead - Waku - would debut in Jungle Tales I#1. 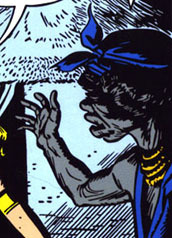 Although most of M'Tuba's appearances were drawn by Werner Roth his solo feature was drawn by John Buscema. Note that Numa the lion and Saki the leopard are generic names given to all lions and leopards in the Lorna series. For most of the series, Werner Roth depicted M'Tuba as a man garbed in red with a distinctive red cap. Under the cap he had a full head of hair. 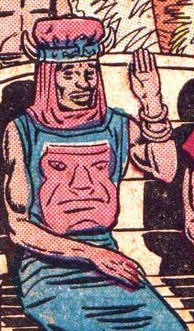 Jay Scott Pike's M'Tuba was never clad in Roth's outfit and when Roth returned to draw him in issue #19, he likewise omitted the red outfit and, for some reason, depicted him as bald. As drawn by Werner Roth, M'Tuba can be seen wearing a golden cross around his neck, indicating he had some level of interaction with Christianity. The precise location in Africa where Lorna is set is not made clear, likely deliberately. 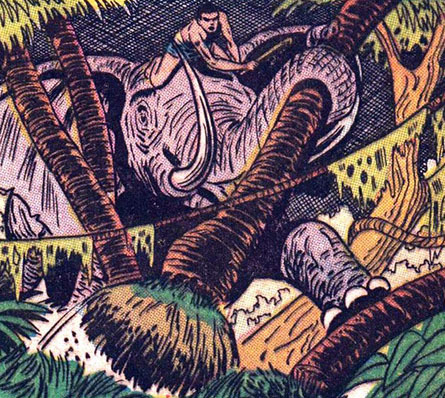 It does appear to be very much like the Congo which was the most popular setting for jungle comic heroes (the contemporaneous Jann of the Jungle was set there, for instance). Of course, a considerable deal of creative license is taken with their version of Africa: it's an Africa where cavemen, lost Egyptians, colossal apes, dinosaurs and man-eating plants exist! Do not confuse comic books for reality! In Lorna #19 a narration caption claims M'Tuba "found Lorna as a child." 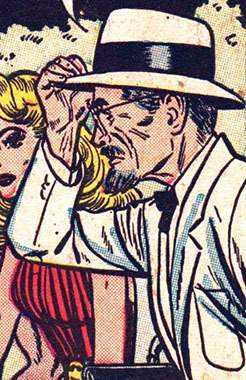 Sure, in the sense that he seemed to be part of her household for some years - but Lorna was 17 when her father died. A minor, certainly, but not exactly a "child!" 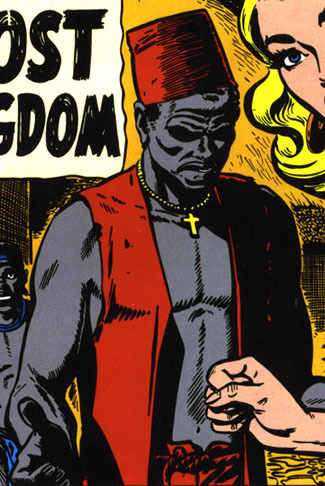 Although M'Tuba became chief of the Wafisi in issue #1, the Wafisi were never referred to by name and the people M'Tuba served as chief to appeared to be of his own tribe, most notably in issue #8 where M'Tuba's nephew appears. Although he was introduced as a lawgiver subordinate to the chief in issue #1, it's possible he became the chief of his own tribe sometime before #8. Kubali was a member of M'Tuba's tribe who killed one of the sacred white pigs around the village and was rendered an outcast for that action. Kubali threatened to kill M'Tuba unless he rescinded the law. M'Tuba did so, but Kubali decided to kill M'Tuba afterward to ensure he didn't change his mind. Kubali tied M'Tuba to a tree with a piece of meat so that a jungle animal would kill him, but Numa the lion appeared immediately and prepared to maul Kubali. M'Tuba stopped Numa with the sound of his voice, but when Kubali refused to set M'Tuba free, Numa killed Kubali. The Wafisi were a tribe of head hunters in the jungle who beheaded their victims and posted their heads upon tall poles. The Wafisi caught Lorna and M'Tuba and intended to claim both their heads but M'Tuba's monkey Mikki set him free and Lorna killed the Wafisi's witch doctor. Lorna proclaimed herself the new witch doctor and instructed the Wafisi to follow M'Tuba as their leader in her stead. Kada was the medicine man of M'Tuba's tribe. When M'Tuba became sick, Kada tended to him and identified juice from the morta plant as the only cure for M'Tuba's condition. When Lorna and Greg Knight brought the morta plant juice to him, Kada's treatment proved successful, saving M'Tuba. Baku is the son of M'Tuba's (deceased) brother and heir to M'Tuba's chiefdom. Baku's mother schemed to have him supplant M'Tuba as chief of their tribe and stabbed Baku with a two-bladed knife to make it appear as though he had been bitten by fangs. Baku claimed he had been attacked by a ghost and later tried to kill Lorna while dressed in a phosphorescent dye so that he would glow in the dark, but Lorna brought in the immense ape Agu the Giant and he easily caught Baku in his hand then revealed him as the supposed ghost. Baku's mother had been married to M'Tuba's brother. Wishing to see her son inherit the title of chief, she schemed to make M'Tuba appear unable to stop the attacks of a supposed ghost so that the tribe would lose confidence in M'Tuba and force him to step down. She stabbed Baku with a two-bladed knife to make it appear as though he had been bitten by fangs and Baku claimed he had been attacked by a ghost. However, Agu the Giant caught Baku and when she saw her son in peril, she admitted everything to Lorna and M'Tuba. Zabu was another medicine man in M'Tuba's tribe. 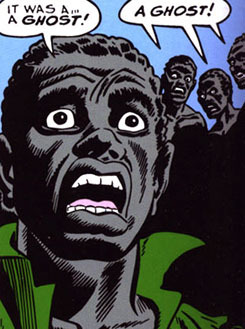 When M'Tuba came down with a terrible fever, Zabu sent his son Bardu to prevent Lorna from bringing Doctor Foster to cure M'Tuba, fearing that he would lose the faith of his tribe if the doctor were successful. However, Zabu succumbed to the same illness as M'Tuba and the doctor needed to save both men. Recovered, Zabu reconciled with M'Tuba. Bardu was the son of Zabu and was sent by him to prevent Lorna from bringing Doctor Foster to cure M'Tuba's fever. Bardu rode upon his tamed elephant Mammo while in pursuit of Lorna. Although Bardu destroyed one sample of the doctor's medicine he soon learned Zabu had succumbed to the same illness. Fortunately, the doctor had a second sample of medicine and cured both M'Tuba and Zabu. Afterward, Bardu offered to ferry Doctor Foster through the jungle astride Mammo. Doctor Foster was a white man who ran a clinic in the jungle nearby the village of M'Tuba. When M'Tuba fell victim to a fever, Doctor Foster brough the medicine to save him and the tribe's medicine man Zabu, despite the initial efforts of Bardu to sabotage him. Afterward, Bardu offered to ferry Doctor Foster through the jungle astride his elephant Mammo.